CD Edition limited to 8000 limited edition copies. 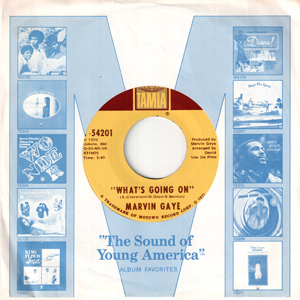 And Marvin Gaye, the brooding Prince of Motown, asked, “What’s Going On?” Marvin’s landmark single, released in January, fronts the latest in Hip-oSelect.com’s continuing series, With Marvin’s breakthrough, Motown—an empire built on 45 rpm singles—took small steps toward album projects. Its musicians, led by the core Funk Brothers band, would be credited on record for the first time, not just on What’s Going On but on the debut album by consistently rising songwriter/producer Valerie Simpson, whose first single appears on this set. Stevie Wonder turned 21, announcing his creative independence with the striking “We Can Work It Out”, a track featuring the Hitsville studio debut of bassist Bob Babbitt, filling in for stalwart Funk Brother James Jamerson. While established stars Four Tops and Martha Reeves & the Vandellas were struggling with the company’s evolution, new kids the Jackson 5 continued their hot streak, knocking a couple of ballads—“Never Can Say Goodbye” and “Maybe Tomorrow”—out of the park. Also on a streak was Rare Earth; their mid-1971 smash “I Just Want To Celebrate” continues to be heard around the world. Gladys Knight & the Pips delivered another classic, “I Don’t Want To Do Wrong.” Former Temptation David Ruffin released a single that was not to see an LP release for 33 years, while Eddie Kendricks left the Tempts on a high note, as “Just My Imagination (Running Away With Me),” featuring Eddie on lead, became their first No. 1 in years. Diana Ross was the emerging solo star. She hosted her first network television special on her own, the hugely successful Diana!. Though her releases were fan favorites and she lacked a Top 10 hit in this period, the show further cemented her star power. And, the marketing muscle behind it illuminated that Berry Gordy was leading Motown to L.A. for good. This is Volume 11A of a 12-part box series. Back in Detroit Norman Whitfield delivered more hits, this time with a brand new group. Challenged by whispers that his success came from inheriting an already successful group (the Temptations), he created the Undisputed Truth. Their hit, “Smiling Faces Sometimes,” was a dark masterpiece. Also debuting on Motown were creative experiments like the “religious rock” group Ken Christie & the Sunday People; show biz perennials Sammy Davis Jr. and Bobby Darin; New Orleans soul man King Floyd; pop singer P.J. (Patti Jerome); Impact of Brass, direct from Miami to compete with the likes of Blood, Sweat & Tears; the future rock star Meatloaf, in duets with Stoney, a.k.a. Shaun Murphy, the future regular backup singer for Bob Seger; and more. All of this wonderful, entertaining, emotional and sometimes quirky music is given a beautiful frame: the “album” style packaging with a rich 148-page booklet featuring unique stories about every song. Co-producer Keith Hughes and Grammy®-nominated author Bill Dahl provide the track-by-track history, not to mention detailed recording and release dates. Harry Webber, Motown’s first official Art Director who went on to become a Madison Avenue legend, opens for the first time a window to the world of Motown album cover art in his introductory essay. Providing the historical overview is Andrew Flory, author and Assistant Professor of Music History at Shenandoah Conservatory. With longer tracks and a greater number of stereo promo mixes and other rarities, one set covering 1971 would have been a whopping 10 discs. To maintain a manageable size for the release, this volume takes the year up through the end of June. The next set, Volume 11B: 1971, will be 5 discs as well, picking up where this one leaves off and continuing through December ’71.